The story and efforts of Dana Pounds, marine biologist, executive director and co-founder of Nature’s Academy, will be celebrated this month in Manatee County, Florida. On April 9, 2013, the Manatee County Board of Commissioners adopted the proclamation that April 20, 2013 shall be designated as Dana Pounds Day. Manatee County honors Dana for her exceptional contributions to the local community and environment, as well as the inspiration she engenders in the minds of local school children and community members. In 2007, Dana and her husband, Jim Pounds, founded Nature’s Academy – a 501 (c) 3 non-profit experiential education company that enhances classroom studies by engaging students in hands-on outdoor investigations. From sustainable agriculture practices to estuarine biodiversity, students study ecological concepts and issues, while understanding the importance of natural resources. Students are also taught to “pay-it-forward” by participating in a coastal clean-up along local shorelines. Even as public school budgets dropped by millions, Dana couldn’t allow these invaluable learning experiences to escape the grasp of local students. Latest statistics reveal that over 58% of Manatee County fifth graders lack proficiency in science1. Meanwhile, studies show that 92% of students exposed to outdoor educational programs academically outperform peers from traditional classroom programs2. With this in mind, Dana began the Island Adventures Project, which employs grants, donations, and sponsorships to deliver the inquiry-driven field trip programs to local public schools free of charge. Since its inception, the project has impacted over 4,500 local fifth graders and removed over 3,000 pounds of litter from nearby shorelines, including Coquina Beach at Anna Maria Island, Florida. While Dana strives to enhance local science literacy and foster environmental stewardship in her community, she also enlightens students on the value of facing and overcoming challenges in life. Prior to founding Nature’s Academy, Dana was diagnosed with a rare cancer affecting her right leg. In the company’s second year, Dana lost both her leg and mother to cancer. Through her struggles and as a cancer survivor, Dana further realized her purpose and the value of delivering lasting educational impressions to her community and future generations. Today, one may find Dana standing on the beach enthusiastically teaching the value of seagrass beds, with her prosthetic leg featuring a coral reef scene and striking the interest of curious fifth graders. She always presents the “silver linings” of her story and reminds students that they can overcome adversity if they put their mind to it. In addition to Manatee County honoring Dana’s services to the community during Dana Pounds Day, Dana was also recently recognized by the Tampa Bay Lightning Foundation as a Community Hero. On March 14, 2013, Dana accepted $50,000 from the Lightning Foundation, designating portions to Nature’s Academy and the Sustany Foundation. Along with the support of Manatee County Parks and Recreation, Nature’s Academy’s portion of this award will fund over 1,000 fifth grade students to receive a free, quality outdoor educational experience! Despite the quick successes of her company’s efforts, Dana is not finished. By the year 2020, Dana aims to fully establish a district-wide program that delivers free annual field trips to all Manatee County fifth grade students. 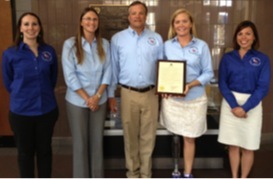 Dana Pounds, with Nature’s Academy staff, holding the official Manatee County proclamation. Pictured from left to right: Kristin Abraham, Sara McCutcheon, Jim Pounds, Dana Pounds, and Jessika Blersch.